Slow Motion: Will enable a time slow down in order to give the player time to analyze the situation around them and to make a wise move. Dash: This ability allows you to make fast moves to any direction with perfect precision. The Barrier: you can use it as a shield or a platform, whether to protect yourself or to help you climb higher. 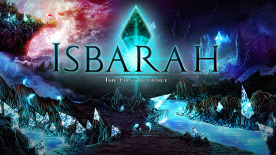 Playing Isbarah, you will be following Iria's journey through her lineage. Iria is a goddess and in order to prevent this world from failing into chaos, her father rules it with an iron fist - and Iria is his only weapon and shield; he uses her to harshly punish anyone or thing that bends the law, and there are no mercies granted. Every single thought made by human beings contributes to the shape and size of this world, creating an ever-changing universe full of creatures and landscapes. These creatures are called The Designed; they all have different shapes and their behaviour depends on the people who have created them. These creatures are only concepts, they haven't been fully created by humans. These Designless creatures are desperate to evolve and become full designs, therefore, they are constantly infecting other full designs to become more powerful and eventually takeover their shapes.